The Okanagan Basin is located in the southern interior of British Columbia and covers 8,200 km2 around the Okanagan Valley. This three years project, called Groundwater Assessment in the Okanagan Basin (GAOB), was completed under the Groundwater program, in the Assessment of regional aquifers towards a national inventory section. The area covered by the study is mainly located in the Kelowna surroundings. It covers the eastern half and southern two thirds of Shorts Creek map (NTS 82 L/04, scale 1:50 000), the eastern half of Peachland map (NTS 82 E/13, scale 1:50 000), all of Kelowna map (NTS 82 E/14, scale 1:50 000), and the southern two thirds of the Oyama map (NTS 82 L/03, scale 1:50 000). Over the lifecycle of the project: fieldwork for regional till sampling, drilling and regular surficial mapping was performed. The different results are presented in spreadsheets, dot maps and various figures format (Annexes 1, 2, 3, 4, 6, 7, 8). 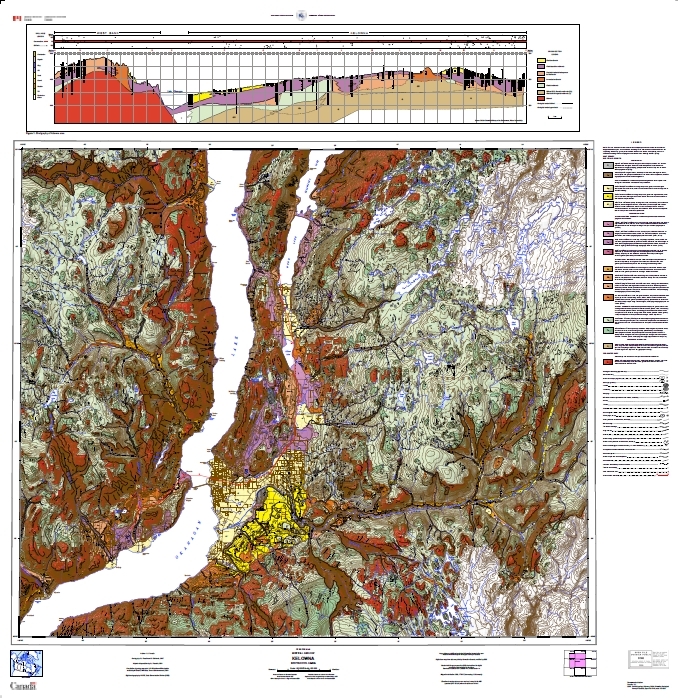 A cartographic open file was published: Paradis, S.J., 2009, Surficial geology, Kelowna. British Columbia; Geological Survey of Canada, Open File 6146, scale 1:50 000 (Annex 5). A geophysics survey was also done and finally a 3D model was produce (Annexes 9, 10, 11, 12, 13, 14). For visualization, the 3D model is presented in GOCAD® format and PDF3D file.